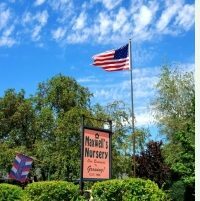 Maxwell's Nursery, established over 60 years ago, is a fully stocked retail nursery serving all of Northeast California and neighboring areas. We offer a large selection of Trees, Shrubs, Perennials, Annual Bedding Plants, Fruit Trees, Berries, Vegetable Plants and Seeds, Pottery and much more. If it grows in our climate there's a good chance you can find it at Maxwell's. We also create all of our own Color Bowls, Hanging Baskets, Planted Containers, and hanging Flower Pouches. We also do custom plantings. Have your own pot or basket you'd like planted? Or have specific colors or combinations you'd like in a pot or basket? Let us plant it for you. We are open for the season from Mid March through Mid October. Monday through Saturday 9a.m. to 5:30p.m. Sunday and Holidays 10a.m. to 4p.m. CELEBRATING 60 YEARS OF BUSINESS IN MODOC COUNTY! Check out the weekly edition of the Modoc County Record newspaper, out every Thursday, for our ad about upcoming sales or specials or just helpful advice. Go to our Facebook for the most current happenings, plus news and other information about sales, etc.